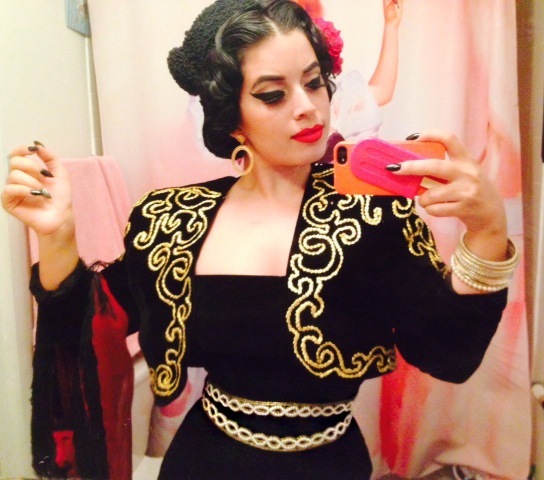 It was the day before Halloween and I was excited and ready to be a Matador for a Halloween party at Beauty Bar. 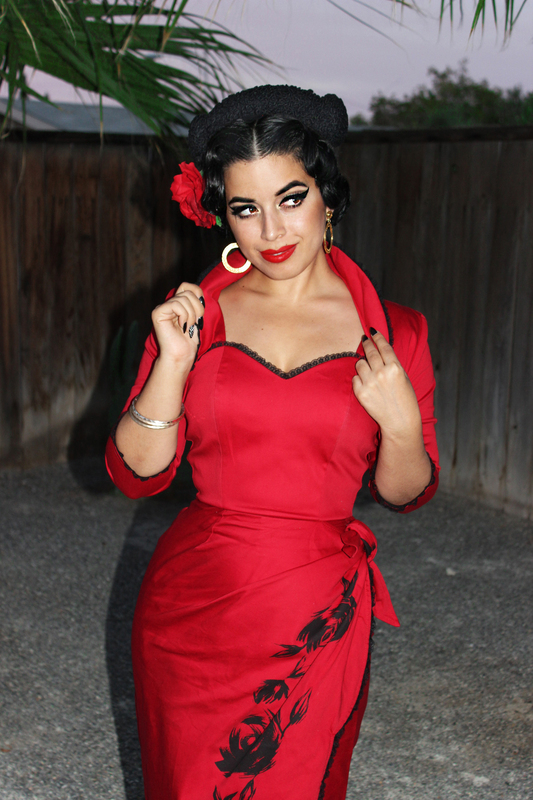 However, before I got into full costume for the nights festivities I decided to make use of my spanish pinup hairstyle and vintage Matador hat by sporting one of my new Pinup Girl Clothing dresses from their Spanish Capsule Collection. Yea, I’m one of those people who sometimes likes to sport two different outfits in one day haha. During the daytime, Inspired by the elegant and regal costumes of Matadors and the beauty and romance of Flamenco dancers, I wore a dress called the Señorita dress from PUG. I wanted to wear something I could wear out that didn’t look like a costume because it wasn’t Halloween yet but who am I kidding, any person would think I was still in costume but that’s ok. Every day is Halloween! Anyway, I love that this dress comes with a cute bolero because sometimes it gets a little nippy at night here in Vegas. It looks sooo good with my vintage Mongolian lamb fur matador hat I purchased just a week before at The Attic here in Las Vegas. 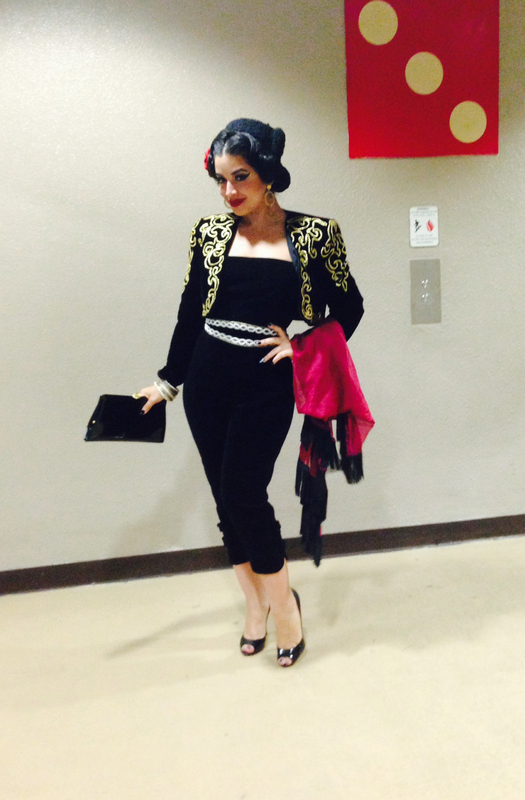 Boy was I lucky to have found a REAL vintage matador hat just a week before Halloween to go with my costume and this outfit! I also added a red rose for a pop of contrast. And you know, because it was the day before Halloween, I also wore a cute coffin-shaped purse called “To Die For” by Tatyana with my patent leather Maryl Christian Louboutin pumps. 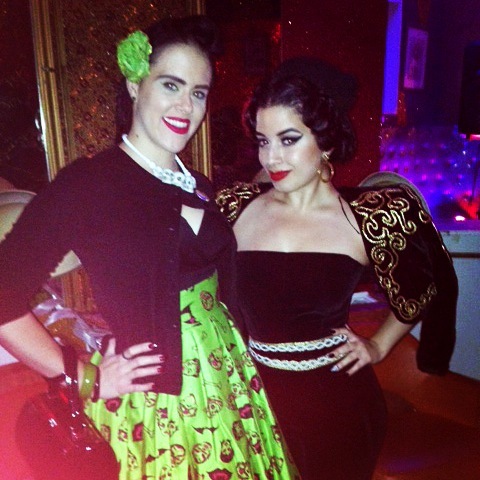 Sadly, I didn’t get to take many photos of my night outfit which was my actual matador costume but I have a few. 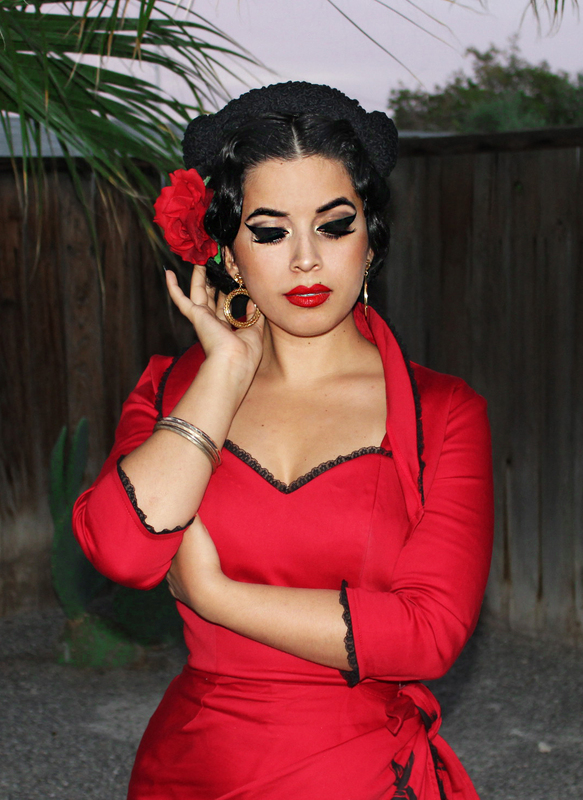 See how I transitioned my matador look from day-to-night by clicking below! Not really sure how I got my bangs to behave for this hairdo but I made it work with Suavecito pomade! I use pomade when I need my bangs to go away haha. Sometimes a girl needs a break right? My hoops are vintage and so are my gold bangles. My vintage matador hat is from The Attic. Coffin shaped Purse is by Tatyana and shoes are from Christian Louboutin. Hope you guys like my day and night outfits! Both outfits look great. Beautiful. You look amazing, as usual my dear. And can I just say how much of a perfect body you have without sounding like a total weirdo creeper? LOL.